Norman McDaniel was born in 1937 in Cumberland County, North Carolina. He was commissioned through the Air Force ROTC program at North Carolina A&T University on June 1, 1959, and he completed Undergraduate Navigator Training at James Connally AFB, Texas, in April 1960. McDaniel then went through Electronic Warfare Officer training at Keesler AFB, Mississippi, and B-52 Stratofortress combat crew training, before serving with the 23rd Bomb Squadron at Travis AFB, California, from June 1961 to June 1964. His next assignment was as a sub-systems manager on the F-111 development project at Wright Patterson AFB, Ohio, where he served from June 1964 to March 1966. Capt McDaniel then began flying combat missions in Southeast Asia as an EB-66C Destroyer Electronic Warfare Officer with the 41st Tactical Reconnaissance Squadron at Takhli Royal Thai AFB, Thailand, and was forced to eject over North Vietnam and taken as a Prisoner of War on July 20, 1966. After spending 2,399 days in captivity, he was released during Operation Homecoming on February 12, 1973. Maj McDaniel next attended Armed Forces Staff College at Norfolk, Virginia, graduating in March 1974, and then received an Air Force Institute of Technology assignment to the Florida Institute of Technology, where he received his Masters degree in Systems Management in 1975. 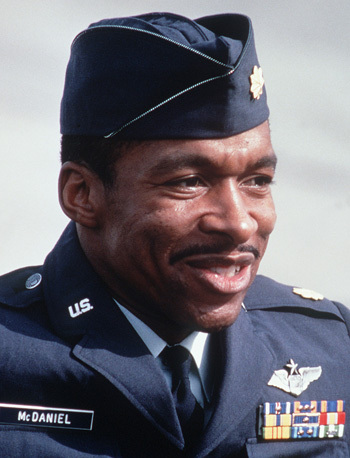 McDaniel then served as a System Program Staff Officer with Air Force Systems Command at Andrews AFB, Maryland, from July 1975 to July 1978. Over the next nine years, he served as Chief of the Congressional Activities Division, Chief of Acquisition Policy Division at Headquarters USAF, Commander of an Air Force ROTC detachment at Howard University, Commander of the 3636th Combat Crew Training Wing, and Deputy Program Manager for the Air Force Project Forecast II Study. Col McDaniel's final assignment was as the Deputy Assistant for Technology Cooperation, International Programs and Technology, in the office of the Under Secretary of Defense for Acquisition, where he served from July 1986 until his retirement from the Air Force on December 31, 1987. After retiring from the Air Force, he worked in the Defense Industry as a Senior Analyst and Staff Systems Engineer, as a Senior Test and Evaluation Analyst, and as a Project Manager. Norman joined the Defense Acquisition University Faculty in May 1991 and served as a Professor of Acquisition Management, Deputy Department Chair, and Department Chair for two separate departments responsible for Program Management and Leadership. He retired from Government Civil Service in January 2006. Norman and his wife Jean Carol have two children, Christopher and Crystal, and four grandchildren-Jonathan, Matthew, Christian, and Christina. For the period 20 July 1966: This officer distinguished himself by gallantry and intrepidity in action in connection with military operations against an opposing armed force during the above period while a Prisoner of War in North Vietnam. Ignoring international agreements on treatment of prisoners of war, the enemy resorted to mental and physical cruelties to obtain information, confessions and propaganda materials. This American resisted their demands by calling upon his deepest inner strengths in a manner which reflected his devotion to duty and great credit upon himself and the United States Air Force.